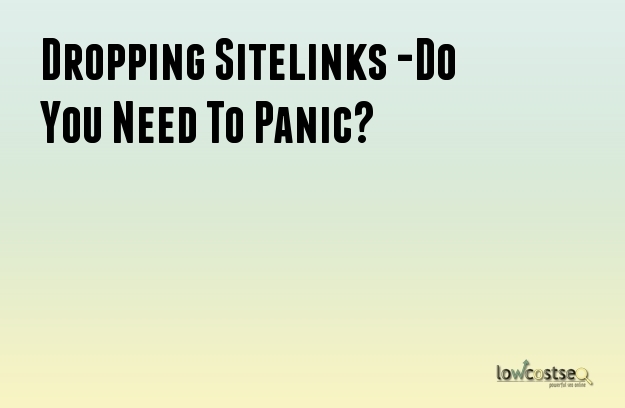 Dropping Sitelinks: Do You Need To Panic? Dropping Sitelinks -Do You Need To Panic? It seems Google has been very busy this week, experimenting with a number of features. However, one area that caught the attention of many SEO companies is the subtle changes to sitelinks on search results. Sitelinks are the blue links that appear beneath your website in the search engine results pages (SERPs) or, more specifically, branded searches. When someone searches for something and Google finds a relevant website, it will often show small sitelinks, highlighting a few pages of the website for better navigation. Large sitelinks are, as the name suggests, visually much larger and often appear on branded searches, where the specific term correlates highly and Google can more accurately recommend pages to the user. Needless to say, this helps people find the exact page they need, which many argue helps to improve bounce rates and general traffic. Just recently, Google has been experimenting with 4 large sitelinks instead of the usual 6. This, of course, had some obvious changes as far as SEO results are concerned. Because less pages were being used by Google, the average position (for companies affected by this experimental change) dropped by around 5 places. Depending on where you are already on the SERP, that could be enough to knock you from page 1 to page 2. However, it was also noted that, on the whole, traffic was not greatly affected. This is because the search terms still generate the results and, additionally, dropping the 2 pages with the lowest click through rates (CTR) ensures that the relevant content – which is always Google’s focus – still gets seen. A similar bug also occurred last month, with small sitelinks disappearing, although Google has since corrected this. For now, this seems to be an experiment and only time will tell if it becomes a permanent feature. Of course, if you are concerned you may be at a loss due to these changes, it’s worth checking your traffic and seeing if any specific landing pages – and their respective keywords – have noticed a drop recently. Current data suggests there is very little change, if any, to overall traffic. If you’re a strong contender for popular keywords, you will remain so, while the smaller long-tail queries will also survive, since these have less competition by their very nature. Google likes to experiment as part of its ongoing quest to improve the search engine experience. These tests don’t always become permanent, but it’s a good chance to gather data about potential changes to implement in the future. This change is really one of simplicity. By dropping 2 sitelinks, there is more space on the SERPs, whether this is used to introduce more results, improve aesthetics or even simplify the process to bring it in-line with mobile search results. Good content will always be shared and the ability to rank on Google, through relevant content and strong backlinks, still remain the same.